If I can read between the lines they're basically saying, "Do you have any of those funny little cylinders laying around that you have no idea what do to with? We can decode them!" So that's what it's come to. Film is such an obscure medium that the phrase mystery film is somewhat repetitive. To most people any film is mystery film. Since few people are likely to shoot it anymore, the developing industry has readjusted its marketing aim to cover all the rolls shot and lost years ago. Perhaps they've recently been discovered under the sofa cushions or in the back of the glovebox. If so they need a decoder. Probably some fun stuff on there. And at $1 per roll who can resist? That's pretty darned cheap. If I had any color 35 laying around I'd know where to take it. As for b/w, it's still cheaper to develop inhouse. It's all beautiful mystery film, sometimes even after it's been decoded. Years ago I toyed with the idea of going Winogrand and making all my film mystery film by throwing it into a big box when exposed. Do that for a year and then periodically scoop a handful out for processing while contributing with newly exposed film. That was also when our local Target would process for $0.75. That's called the Vivian Maier strategy. It can work but it needs a very careful editor. 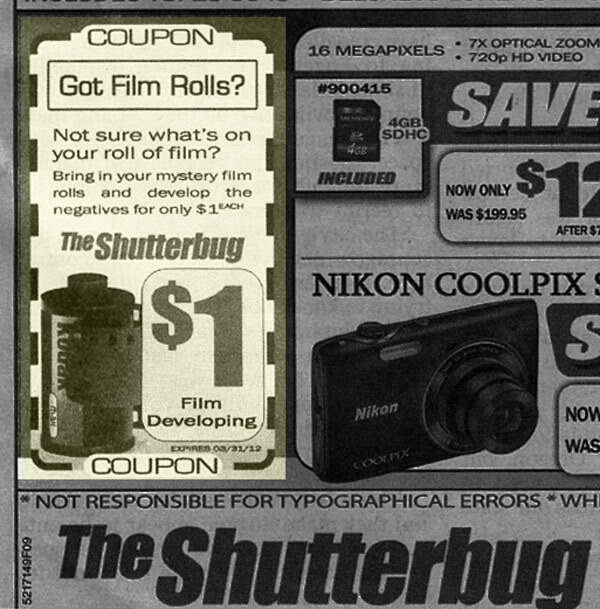 Bring in mystery roll film for development at just a dollar a pop? Sounds good! But if they don't return my 116 spools, Panchromosa lachrymosa. What are the odds that any of those mystery rolls will be Kodachrome? That is just pretty much exactly what I did in the days when I shot a lot of film. The reason...Rushing home to develop what I had just shot hoping I might have some good stuff almost always ended in disappointment. Better to grab rolls at random with no expectations and get some pleasant surprises. A while back I had a roll of Tri-X processed that had been sitting in a drawer for 27 years, since roughly my last year at summer camp. Surprisingly, one or two of the photos were actually decent.